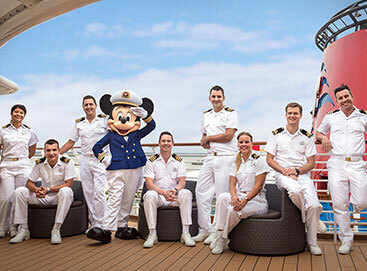 Entertainment Operations, led by the Cruise Director, is comprised of more than 50 positions in several departments including Adult & Family Programming, Youth Activities, Port Adventures & Recreation, Technicians, Mainstage (The Cast) & Character Performers and Musicians. 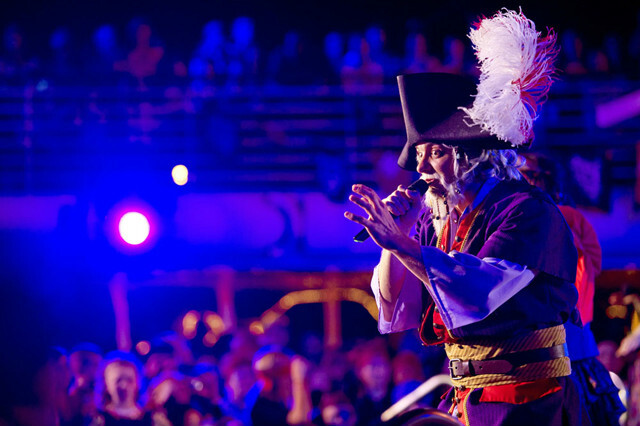 Whether the crew is working with children or setting the stage for world-class entertainment productions, the work they do adds a fun and magical element to our voyages. Our amazing crew members are a big part of why Disney is known as a world-renowned leader in the entertainment industry. This position is a part of the "Cruise Staff" team, catering to an adult and/or family audience. Acts as assistant emcee while supporting the Entertainment Activities Manager, Club Host and/or Entertainment Hosts/Hostesses. Ensures set-up and clean-up of all adult/family activities. Participates in day/evening deck parties, games shows, trivia contests, sports challenges, ship/island tours, bingo, etc. Assists with the Port Adventures (shore excursion) operation. Helps with island rentals and activities on Castaway Cay. Seeks out guest contact and displays enthusiasm and boundless amounts of energy. This role has high guest interaction and involves some microphone use and onstage activity. Consideration for this role does require an audition. This position is a part of the "Cruise Staff" team, catering to an adult and/or family audience. Acts as in-house DJ, orchestrating an inviting and energetic atmosphere for onboard/island events and venues. Performs Cruise Staff duties when not acting as in-house DJ. Acts as assistant emcee while supporting the Club Host, Entertainment Hosts/Hostesses and/or a Specialty Guest DJ. Assists with the Port Adventures (shore excursion) operation. Helps with island rentals and activities on Castaway Cay. Seeks out guest contact and displays enthusiasm and boundless amounts of energy. This role has high guest interaction and involves some microphone use and onstage activity. Consideration for this role does require an audition. 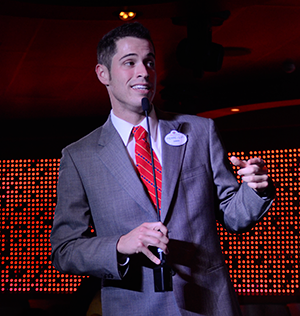 This position is a part of the "Cruise Staff" team and acts as emcee for all adult/family activities. Learns and performs scripted material and choreography. Participates in day/evening deck parties, games shows, trivia contests, sports challenges, ship/island tours, bingo, etc. Introduces specialty acts and Specialty Guest DJ. Assists with the Port Adventures (shore excursion) operation. Helps with island rentals and activities on Castaway Cay. Seeks out guest contact and displays enthusiasm and boundless amounts of energy. This role has high guest interaction and involves ongoing microphone use and regular onstage activity. This role is typically promoted from the Cruise Staff role. Consideration for this role does require an audition. Various levels of Technicians exist within the Entertainment Technical department. Each position has a specific focus, including audio & lighting, special effects, broadcast, show control, rigging & stage hand support, costuming, cosmetology, or props & puppets. 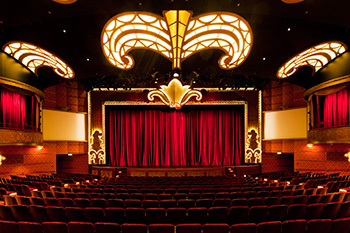 Depending on experience, Technicians either support the Walt Disney Theatre or the Shipwide team. They work with state-of-the-art gear to provide quality Disney-themed, Broadway-caliber productions, outdoor fireworks and stunning special effects. 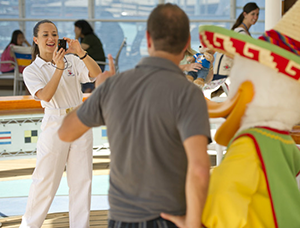 Operates and oversees all water-based and recreation spaces onboard the ship, including opening and closing, monitoring safety, assessing volume and observing general activity around pool areas and slides. Sets up and provides guests with equipment in shipboard recreation spaces including sports decks, ping pong, shuffleboard, foosball, miniature golf and sports simulators. Assists the Port Adventures team as needed, including dispatching tours, operating the sales desk, stuffing envelopes and delivering pre-booked tickets. This position has high guest interaction. Do you have at least one year of beach or open-water lifeguarding experience? You might be interested in our Recreation Staff position. Click here to learn more! 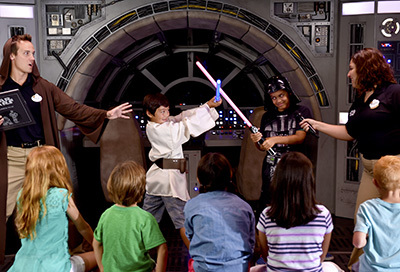 Provides one-of-a-kind Disney entertainment. 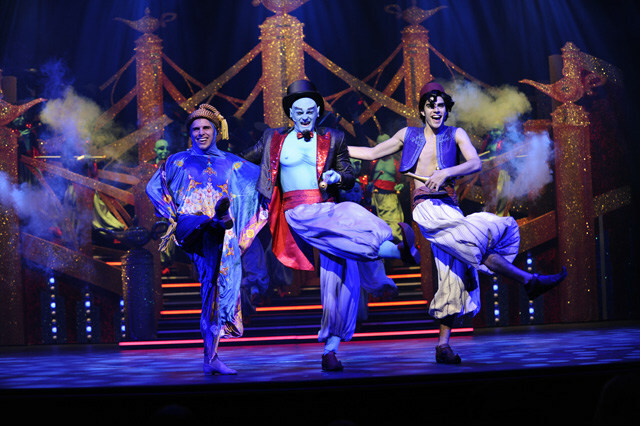 Those interested in becoming a Mainstage or Disney Character Performer must attend an in-person audition. Please visit disneyauditions.com for upcoming audition dates and locations. Interacts with and supervises our youngest guests in a themed onboard daycare center by providing a safe and entertaining environment. Facilitates active and/or relaxed unstructured playtime while taking care of all infant/toddler needs. Extensively cleans nursery spaces throughout day. Maintains and ensures cleanliness of nursery according to USPH and Disney standards. This role has high guest interaction. Flounder's Reef Nursery (Disney Wonder) and It's A Small World Nursery (Disney Magic/Disney Dream/Disney Fantasy) offer care for infants and toddlers. 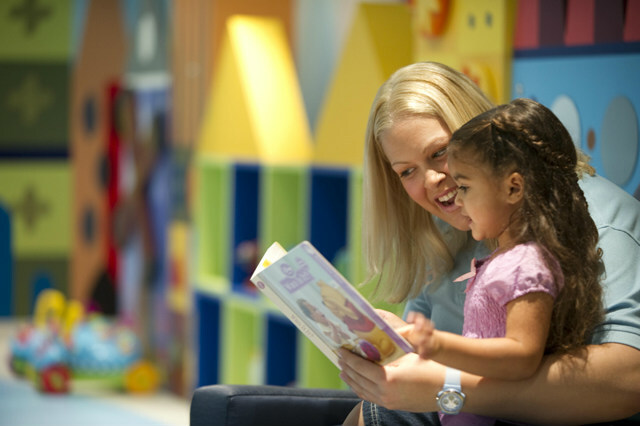 Nursery Counselors work with children ages 6 months to 3 years. Interacts with and supervises children by providing a safe and entertaining environment. 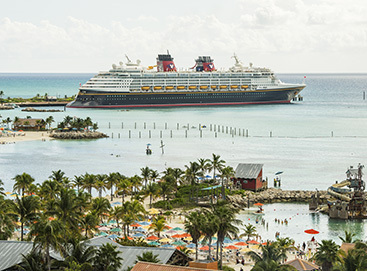 Provides set-up, clean-up and program support to Youth Entertainment Hosts during facilitated programs and activities occurring onboard as well as on Disney's private island, Castaway Cay. Extensively cleans youth spaces throughout day to uphold USPH and Disney standards. Meets and greets all guests and could assist with onboard registration and check in/out process. Preps food trays for children during meal or snack periods. Spontaneously entertains large volumes of children in absence of planned activities. Occasionally facilitates and presents smaller-scale activities to groups varying in size, requiring the use of a microphone. Functions as Nursery Counselor during high volume periods. Ensures secured programming policies are followed. Occasionally assists with the Port Adventures (shore excursion) operation. Helps with island rentals, beach set-up/clean-up, and games and activities on Castaway Cay. This role has high guest interaction. 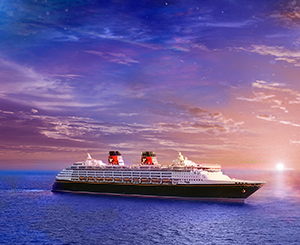 Disney Cruise Line offers programs and activities designed to capture the interest of youth, ages 3-17. 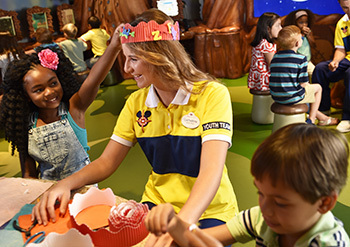 New crew members work with children ages 3-12 in Disney's Oceaneer Club and Disney's Oceaneer Lab. Acts as youth host and engages children in one-of-a-kind youth activities and programs. Learns and performs scripted material and choreography. 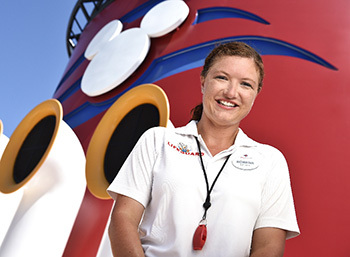 When not hosting, takes on responsibilities of a Youth Counselor by providing set-up, clean-up and program support to other Youth Entertainment Hosts and Youth Counselors during facilitated programs and activities occurring onboard as well as on Disney's private island, Castaway Cay. Extensively cleans youth spaces throughout day. Maintains and ensures cleanliness of areas to uphold USPH and Disney standards. Meets and greets all guests and assists with onboard registration and check in/out process. Preps food trays for children during meal or snack periods. Occasionally assists with the Port Adventures (shore excursion) operation. Helps with island rentals, beach set-up/clean-up, games and activities on Castaway Cay. Seeks out guest contact and displays enthusiasm and boundless amounts of energy. This role has high guest interaction and involves ongoing microphone use and regular onstage activity. This role is typically promoted from the Youth Activities Counselor position. Consideration for this role does require an audition. 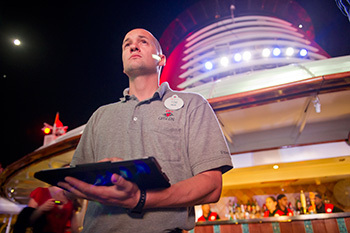 Partners with the Cruise Director to oversee the daily operation of all entertainment and adult/family programming. Provides master entertainment schedule and oversees shipwide guest communication and collateral. 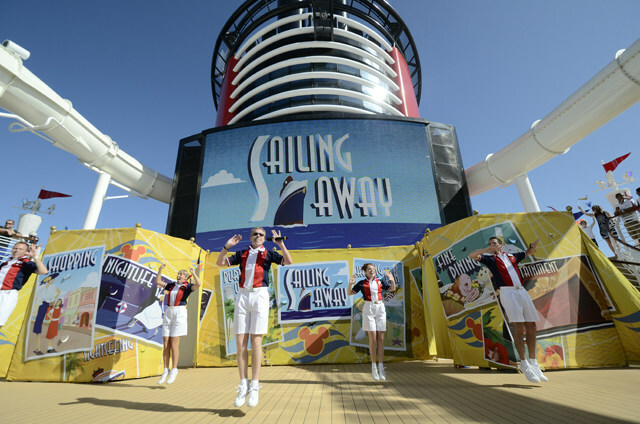 Partners with onboard leaders to execute the daily schedule of shipwide entertainment. Responsible for the delivery of onboard Bingo program, while ensuring the team is focused on achieving revenue targets. Partners with Port Adventures to ensure smooth dispatch operation on port days. Oversees all music offerings and manages Musician schedules. Partners with Entertainment Technician team to ensure balance of background music, moving/set-up of Musician equipment, costuming needs, etc. Communicates with Cruise Director and Shoreside Director, Entertainment Operations regarding consistency of operation between ships, show quality, crew scheduling, team performance, etc. Manages onboard adult/family operational budget. Partners with Shoreside Marketing/Promotions and onboard departments to plan and execute special events. Provides daily leadership and development for all direct reports. Is prepared to cover for Cruise Director in all aspects, when necessary. This position reports to the Cruise Director and has high guest interaction. Provides leadership support to the Port Adventures Manager and Port Adventures team (Port Adventures Hosts/Hostesses and Recreation Staff). Oversees and executes sales of Port Adventures (shore excursions) and desk operation. Escorts tours when needed. Monitors operation of all recreation spaces including pools, slides, sports deck, outdoor games, mini golf and sports simulators (Disney Dream/Disney Fantasy). Oversees training for crew. Oversees supply inventory and ensures the receiving of new supplies. Creates daily work schedules for crew. Ensures cleanliness of areas to uphold USPH and Disney standards. This position reports to the Port Adventures Manager and has high guest interaction. Provides leadership support to the Youth Activities Manager and Youth Activities team. Assists in overseeing the daily operation. Oversees training for crew. Reports maintenance needs. Oversees supply inventory and ensures receiving of new supplies. Creates daily work schedules for crew. Ensures cleanliness of areas to uphold USPH and Disney standards. This position reports to the Youth Activities Manager and has high guest interaction. Operates complex audio console for front-of-house and onstage audio monitoring for all shows. 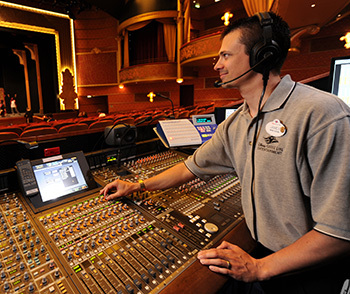 Oversees training for Audio Technician Walt Disney Theatre position. Performs sound and microphone checks for performers, guest speakers and event hosts. 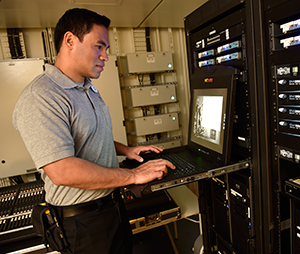 Responsible for installation, set-up, operation, preventive maintenance and testing of theatrical technical audio control equipment throughout the ship. This position reports to the Senior Technician, Walt Disney Theatre. 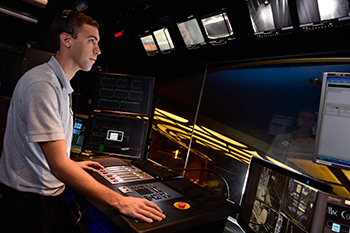 Operates automation system during Broadway-caliber performances in the Walt Disney Theatre (WDT). Responsible for safe operation of scenic elements during stage shows and rigging equipment during outdoor deck parties. Oversees routine maintenance on shipwide auotmation and rigging systems, including documentation. This position reports to the Senior Technician WDT. Operates cameras (single and multi/remote) for all live and as-live show and shipwide performances. Provides direction and vision mixing for live shows and performances. Oversees video production, editing and post production of all required original programming and content creation. Encodes all material for archive and transmission. This position reports to the Senior Broadcast Technician. Oversees daily Character Performer operation. Responsible for the scheduling, logistics and presentation of Character Performer appearances, events and onboard programs. Provides leadership, coaching and development for Character Performer team. Direct reports range between 13-20, depending upon ship. Serves as main point of contact for any performer-related needs. Ensures Character integrity and brand are maintained. Creates and communicates daily rehearsals, call times and performance schedules; partners with other shipboard leaders regarding use of Character Performers in shipboard events and activities as needed. Manages Character Performer appearances off the ship in partnership with shoreside departments. This position reports to the Cruise Director and has high guest interaction. Acts as lead emcee for all adult/family activities. Promotes activities specifically catering to an adult audience. Learns and performs scripted material and choreography. Participates in day/evening deck parties, games shows, trivia contests, sports challenges, ship/island tours, bingo, etc. Introduces specialty acts and/or occasionally a Specialty Guest DJ. Hosts activities on Castaway Cay. Seeks out guest contact and displays enthusiasm and boundless amounts of energy. This position reports to the Assistant Cruise Director and has high guest interaction. Responsibilities involve ongoing microphone use and regular onstage activity. Those in this position are typically promoted from the Entertainment Host position. Consideration for this role does require an audition. Serves as the 'Cruise Director for the crew' and is the primary point of contact for all crew activities. Responsible for set-up/clean-up, organization and facilitation of all crew activities, events and crew recreational facilities. Communicates activities and events to crew via the production of collateral and Crew TV. Monitors crew entertainment/activities budget. Coordinates activities and crew-specific offerings at all ports of call. Partners with shipboard Environmental Officer and Shoreside Community Relations team to encourage crew involvement in all ports of call. Recruits crew volunteers, communicates with shipboard leaders and crew at large, organizes local transportation needs and provides feedback to shoreside partners. Actively participates in other onboard crew committees focusing on crew welfare, diversity, crew food, etc. This position reports to the Assistant Cruise Director and has high crew interaction and low guest interaction. Provides leadership to the Cruise Staff team (Cruise Staff, Cruise Staff/DJ and Entertainment Hosts/Hostesses). Responsible for overseeing all activities for an adult/family audience. Supports team as emcee. Oversees onboard Bingo program, handles administrative side of operation and corresponds with shoreside Bingo vendor. Manages overall ordering and stock. Creates daily work schedules for crew. Oversees training for crew. 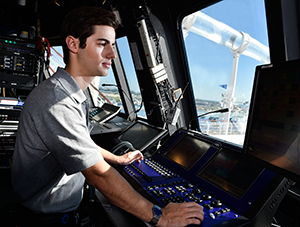 This position reports to the Assistant Cruise Director and has high guest interaction.modifications to those who create the base content for all materials printed. Will partner with Crew Activities Manager and onboard teams to assist in the creation and/or printing of materials relating to Crew communication. Responsible for the day-to-day maintenance of One Source/CMA (Content Management Application), the system supporting Guest information platforms and applications including, but not limited to the Personal Navigator (paper), Navigator app and digital signage. Will partner with Assistant Cruise Director and provide recommendations regarding a suitable and visually appealing layout and verbiage enhancements or modifications to those who create the base content for all materials printed. Will partner with Crew Activities Manager and onboard teams to assist in the creation and/or printing of materials relating to Crew communication. Responsible for installation, set-up, operation, testing and maintenance of show control, lighting and special effects systems throughout the ship (not including the Walt Disney Theatre). Maintains, tests and fires pyrotechnic and laser systems in shipwide venues and outdoor deck parties. Responsible for all interactive show technologies in Animator's Palate, Youth Activities venues and lounge areas. Assists with programming and maintainance of AMX network and Cruise Control. This position reports to the Senior Technician Shipwide. Responsible for installation, set-up, testing and maintenance of show control systems and equipment in the Walt Disney Theatre (WDT). Operates complex show control console for all WDT Broadway-caliber stage shows. Maintains, tests and fires pyrotechnic and laser systems in the WDT. Oversees the LX department monthly maintenance. Responsible for stock control of show consumables. This position reports to the Senior Technician WDT. Leads the Broadcast team, and facilitates department meetings. 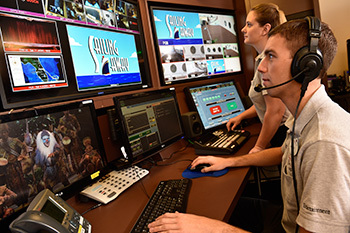 Ensures that the operation and programming of broadcast and shipwide control systems, guest and crew TV content, Buena Vista Theatre and Walt Disney Theatre 33mm movie projection, dining rooms, funnel vision TV, and videography and editing is meticulous. Coordinates the engineering and operation of camera, VTR, transmission systems and live multi-camera vision mixing. Programs and maintains the automated scheduling and video server playback systems. Develops daily schedules for the Broadcast Projectionist. Makes necessary updates to the Coolsign media player. Decrypts any new movies and sitcoms for the movie channel and updates the movie schedule for guest staterooms. Coordinates and assists in the preventative maintenance and routine repair of all broadcast and projection equipment including all shipwide televisions. Provides leadership to the Shipwide Technician team (General Technicians). 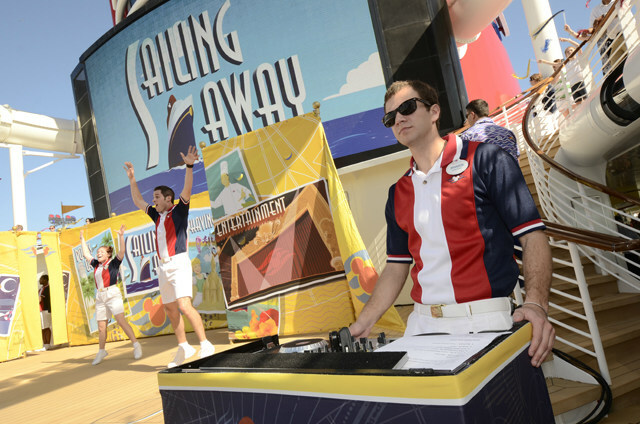 Oversees daily operation and maintenance of all shipwide entertainment spaces (excluding Walt Disney Theatre). Ensures daily set/strike of equipment and operation of entertainment offerings. Conducts routine maintenance checks. Oversees training for crew. Oversees supply inventory and ensures receiving of new supplies. Creates daily work schedules for crew. Ensures cleanliness of areas to uphold USPH and Disney standards. This position reports to the Technical Production Manager and has some guest interaction. 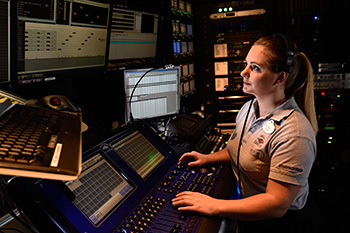 Provides leadership to the Walt Disney Theatre technician team (Audio positions, Stage Props/Puppets, Show Control positions, Automation Operator, Entertainment Rigger/Stage Hand, and Stage Lighting & Special Effects Technicians). Responsible for the operation, daily set/strike, supervision and maintenance of the Walt Disney Theatre and its productions/shows. Partners with Stage Manager regarding productions/shows. Runs senior show tracks for all shows. Conducts routine maintenance checks. Oversees training for crew. Oversees supply inventory and ensures receiving of new supplies. Creates daily work schedules for crew. Ensures cleanliness of areas to uphold USPH and Disney standards. This position reports to the Technical Production Manager. 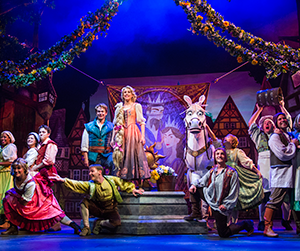 Oversees all aspects of live show performances in the Walt Disney Theatre while providing leadership, coaching and development for the team of Mainstage Performers. Direct reports range between 20-26, depending upon ship. Acts as Company Manager for the Cast. Calls all technical show cues (extensive show cues with automation, audio, moving lights, spotlights, electronics, pyrotechnics and performance flying systems). Works closely with Cruise Director; Technical Production Manager; Assistant Stage Manager; Senior Technician, Walt Disney Theatre; and Senior Costume Technician in relation to show and technical operations within the Walt Disney Theatre. 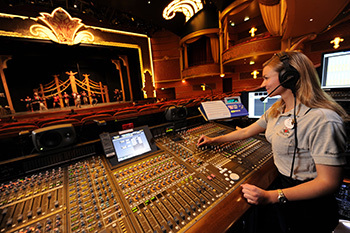 Oversees rehearsals, warm-ups, show modifications and other factors related to the running of each Walt Disney Theatre show, while working closely with Character Manager, Assistant Stage Manager (Disney Dream/Disney Fantasy only), Dance Captains, Vocal Captain, Fight Captain, Animation Captain and/or Character Line Captain. Completes show and daily reports. This position reports to the Cruise Director and has some guest interaction. Provides leadership to a portion of the Youth Activities team (Youth Activities Counselors, Nursery Counselors, Youth Entertainment Hosts/Hostesses, Assistant Youth Activities Manager and Assistant Nursery Manager). Responsible for the implementation and handling of the daily operation as well as the guest experience for all youth spaces. Responsible for children's Navigator. Oversees training for crew. Ensures cleanliness of areas to uphold USPH and Disney standards. This position reports to the Manager, Youth Activities and has high guest interaction.